I’m getting deeper into sculpting canvas and I’m loving it. Today I’m on my third piece in the Stretched Skin series and it’s starting to hit another level. There are so many material and process things to consider when you are sculpting canvas using every trick you can find- tension, sewing, molding, manipulating. I’m using the knowledge of how fabric moves from my experience sewing and weaving- the way a weave is more flexible in certain directions and how it does and does not want to move. I even made a sort of hidden dart (a part of the fabric you take in, like on the waist of a dress) in the painting today to keep the visible fabric taut without losing the outline. In addition to thinking about how fabric itself will work I need to take into account how the gesso and the shrinkage will effect the fabric. Then there are the things that you are never supposed to do when you stretch a canvas- things that cause wrinkles for example. Those things are suddenly fair game… because sometimes I want wrinkles (like the top left corner of the second layer above) and so I break those rules too. The tricky part is doing it all in a balanced enough way that the frame doesn’t warp. This also involves putting in some working tension lines that I will re-do to fit better aesthetically later. At this stage it’s about getting the tension right. For example- the zig-zag in the center slit-thing will become roughly parallel lines. Right now the top layer is not attached (and will not be until I paint the bottom two) but I could see the bones of the piece for the first time today and it was very exciting. This piece is taking the sculpting to a new level by using the draped/cast mask form. The new process could have gone more smoothly, but it’s looking exactly how I want it too now. Next time it will. Today the process of doing the two under-layers was fantastic. I’m getting a real feel for how to make the canvas do what I want it to and it just flies now. It’s a fantastic feeling. I’m really enjoying this piece and can’t wait to paint it. The very first sculpted canvas I did was also the first painting on canvas that I ever did- sometime in 10th grade (’92?). I have never felt compelled by traditional rules for painting and was always interested in the space between painting and sculpture. Interestingly that same year a high school ceramics teacher bought a ceramics piece of mine because he thought it was a revolutionary way for painting to emerge in clay in 3D. Now doubt ceramics will come back into my life soon. In art school a made a few pieces that pushed those boundaries in an experimental way. 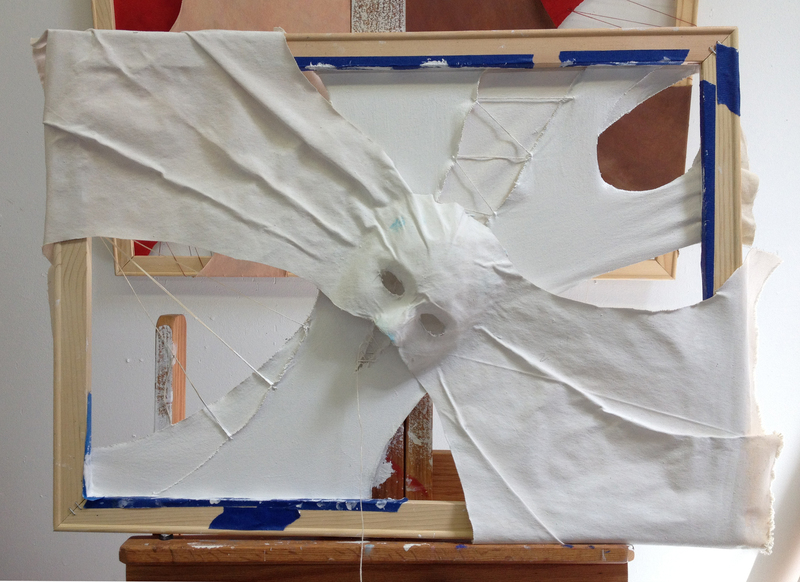 Then I started to take it on in earnest in the Sculpted Canvas Series. I have the feeling of my identity as an artist growing clearer and tighter (despite the many media and styles). I feel everything getting easier and paradoxically more interesting and challenging at the same time- the challenges are on a different level now. I’m looking forward to exploring them even farther in the upcoming MFA program.